This is the first in a series of blog posts discussing major figures in film and literature, based on the Major Arcana of the Tarot. I'll be using the 21 Major Arcana of the standard Rider-Waite-Smith Tarot deck. For some more background on the deck's history and its elusive role in popular culture, see this post from HiLowBrow, which is a good primer on the Tarot, and pretty fascinating in its own right. "This much Kafka was absolutely sure of: first, that someone must be a fool if he is to help; second, that only a fool's help is real help." Walter Benjamin sees Kafka as the earliest writer to abandon the search for truth in the fading light of tradition, the first modern man to disavow wisdom and embrace folly in its place. Kafka's world was a place where failure had already taken hold, and tranquility in submission was man's only sensible recourse. All of Europe was standing on a precipice; Kafka was the only one willing to stare over the edge. Kafka's encounter with a world of failure and futility ruled out redemptive endings to his stories. There's never a light at the end of the tunnel; not for Gregor, not for Georg of The Judgment, and not for the officer in In the Penal Colony. Doom is not just behind them, rushing along in pursuit; nor is it waiting for them at the end of a chain of unfortunate events. Doom is all around them, the absurdity of the world at every moment. The only virtue these characters have left is to take some kind of ownership, to thrash in the throes their own irresolvable entanglements. In these doomed characters, the reader finds the deepest wellspring of agency and responsibility: decisions made in the face of the radical unknown, without the guiding lights of conscience or logic or self-preservation. In the forest of contingency, the Fool searches for a way forward, accepting that every step is a non-sequitur, that every breath inhaled is a leap of faith. The Fool has been condemned by his father, betrayed by the comforts of religion and sexuality, abandoned by the literary establishment and the legal system. All that's left is the labyrinth, and the Fool himself, the figure shuddering against its background. 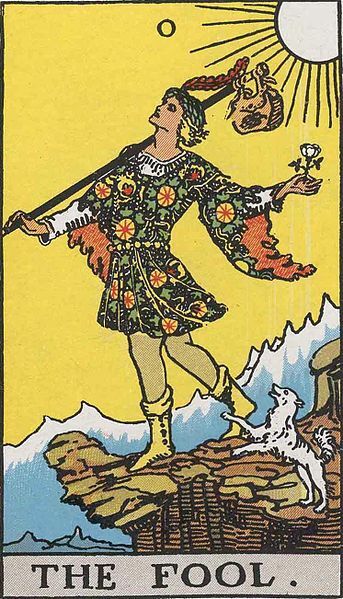 The Fool card is folly, a dialectical balancing act between volition and paralyzing uncertainty. It is the protagonist of a nonsensical story, the Zero as opposed to the One. According to a common interpretation, the rest of the cards represent the journey of this primary Arcana through his life. It's particularly Kafkaesque that the Tarot spread is basically the Fool's act of looking himself in the eye, and seeing only an empty space. And yet the Fool, like Kafka and all his characters, is condemned to stand up and say, "I am here, at the mercy of your absurd convulsions. Take me and do with me what you will."